An esthetic, super clear, razor sharp and untreated (natural color) Anglesite. From the great finds in 1980-90 at Touissit, these are now regarded as the worlds best for the specie. Far better in person this is a delicate light greenish yellow hue and from some angles shows fine internal rainbows. Undamaged by naked eye, very tiny chips can be found only with 20X magnification, this is virtually perfect and quite impressive for this very fragile mineral! 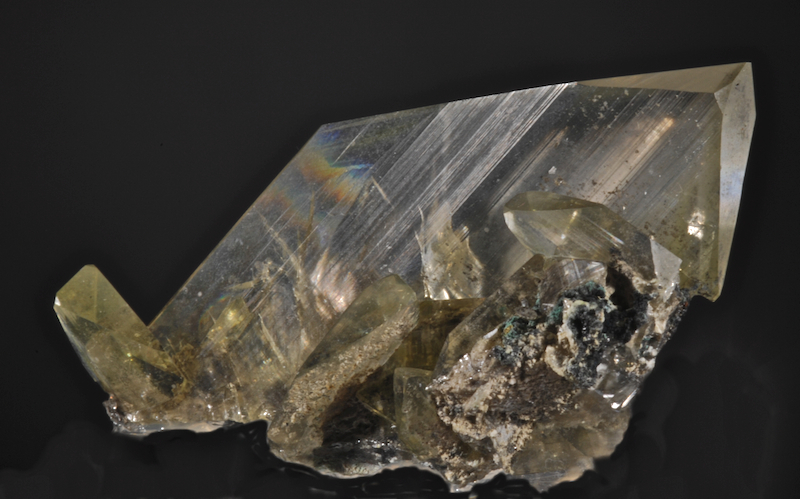 The Transbaikalia region has sporadically been the source of some fine tourmalines. When available in good quality these represent a great value as they are distinctive and relatively low priced compared to most other locales. This is a particularly nice example in excellent condition with super color very similar to the classic Jonas Mine (which command a LOT more money!). 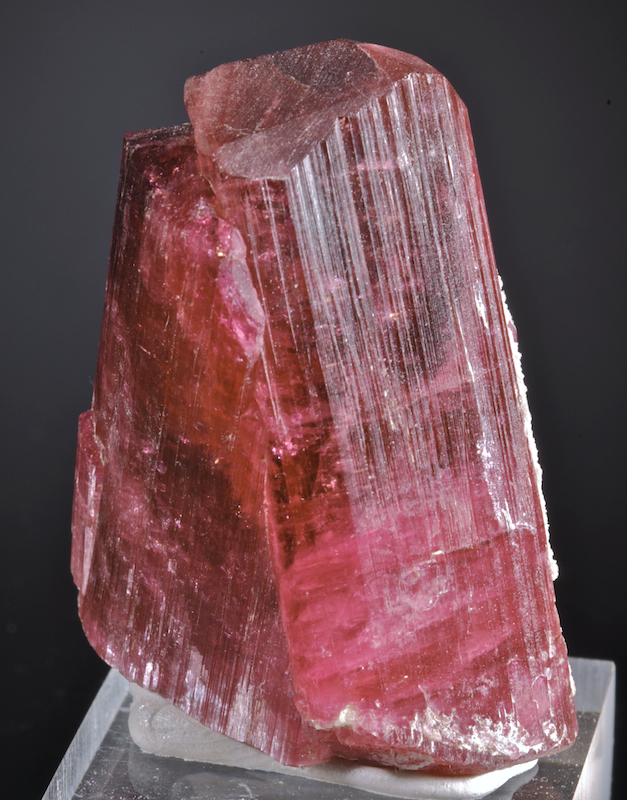 Composed of two perfectly terminated crystals joining at an angle, this displays well with a lot of impact for its size. Striking, esthetic and unusual, this is a fine, undamaged piece with an "odd" color hue. 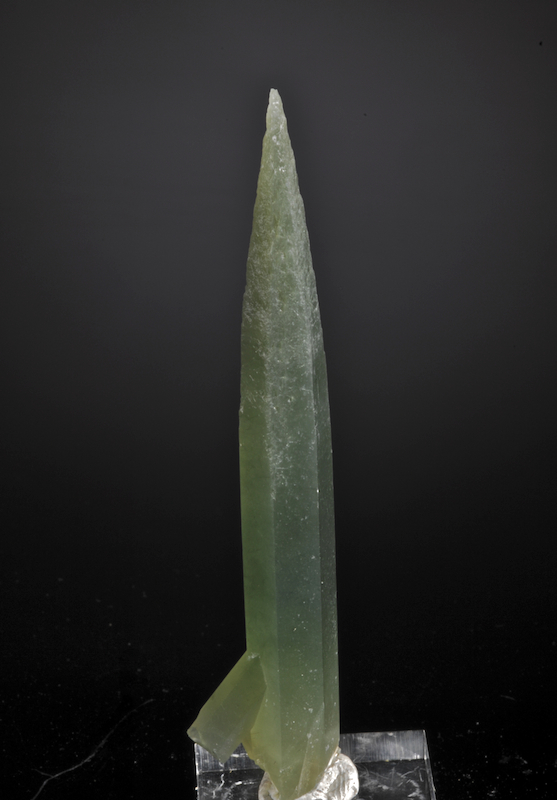 The Shaba Dioptase can be quite impressive but rarely this delicate and sculptural with no matrix. 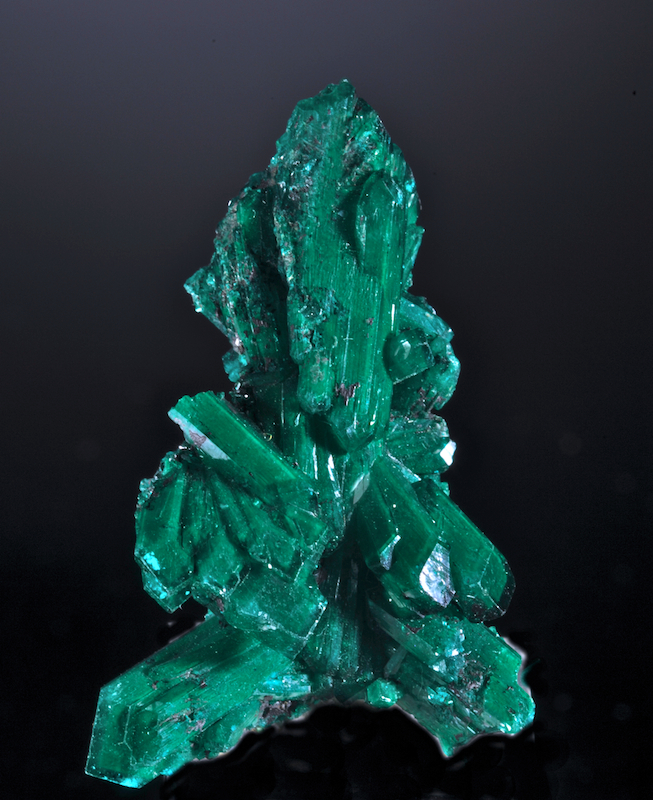 The color in person looks almost a Malachite green but with a brilliant glassy luster, there is good transparency too as seen in some of the best Tsumeb Dioptase. A fine specimen from anyplace this is especially nice for Katanga area. 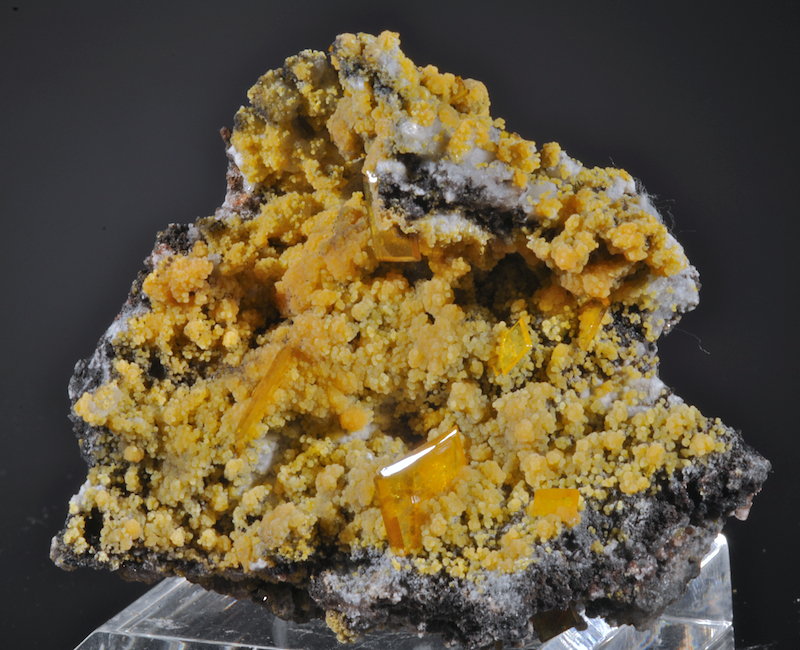 From a small find made 2002 this is one of the best single crystals recovered. 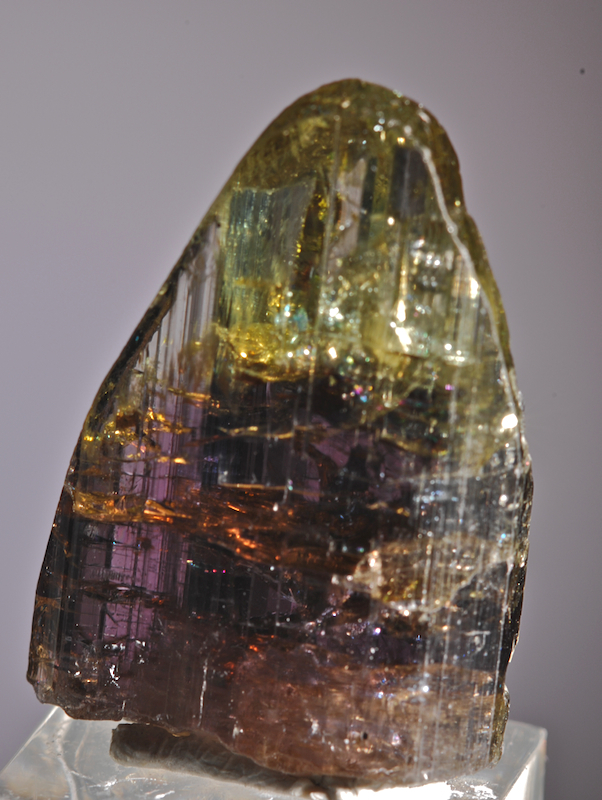 Undamaged, sizable at over 10CM long, with excellent luster and translucence. The upper half of this shows a distinct Tessin habit but the lower half does not. Similar to some of the recent Himalayan quartz and the classic Greek included quartz, this has a noticably different look and texture. A wonderful combination specimen with impressive esthetics. From the Hladysz collection, this is an outstanding example of what could sometimes be found at the Benchmark Quarry 25 years ago. Bill Hladysz had exclusive permission to extract specimens there for decades, this is a gem from his personal collection now being dispursed. No eye visible damage, what may look like a chip on the calcite is not, it is a stepped edge growth. 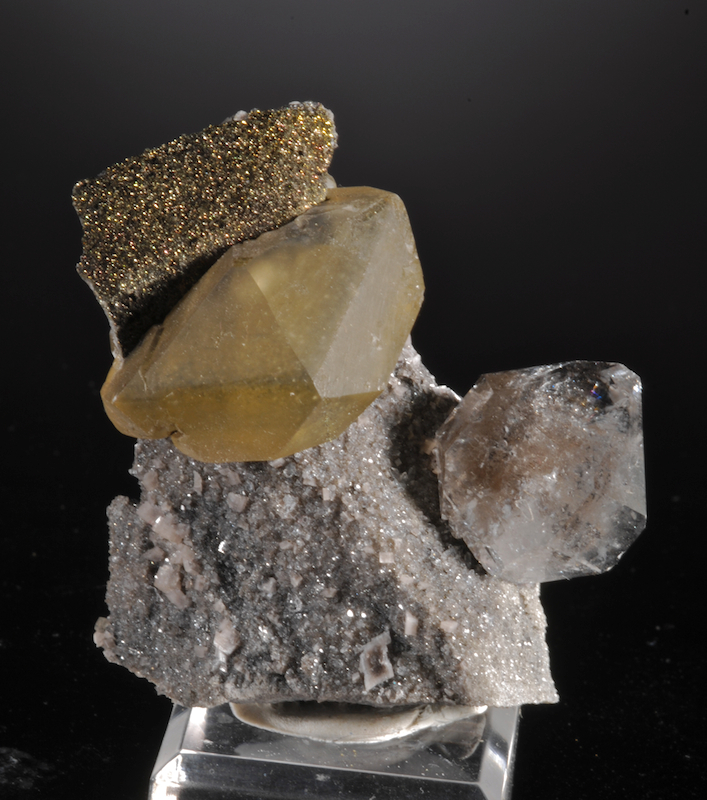 A super specimen from Erongo which displays very well and has remarkable esthetics. The black Tourmaline has brilliant luster in person and has a prismatic termination at the top and a lower termination of the fibrous type on the bottom. 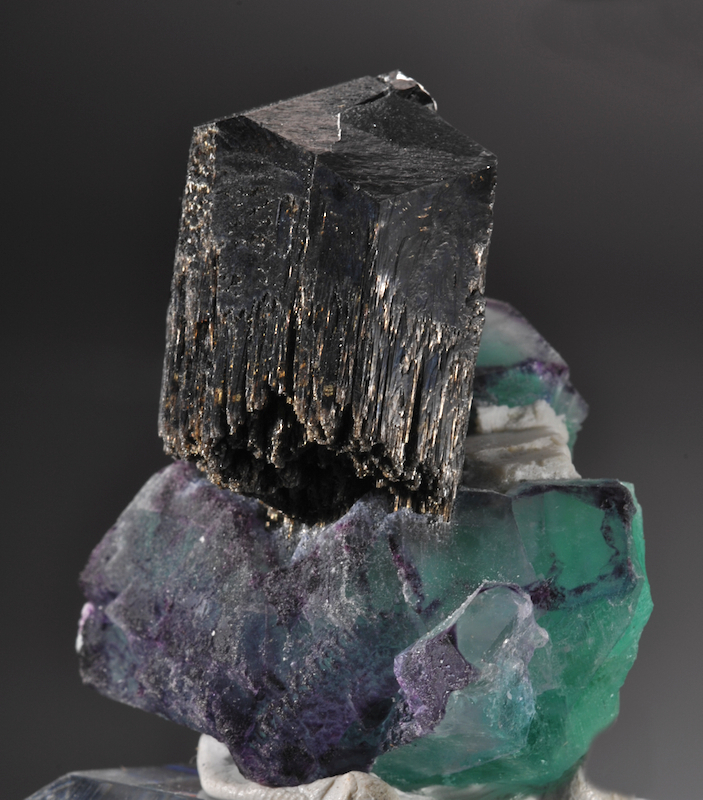 The contrast with the bi-color green and purple zoned fluorite gives this piece its great esthetics. In excellent condition damage wise, the photos do not do this one justice!